More than five decades have passed and thinking about that stupid report card still haunts me from time to time. But here’s the thing I don’t think anyone realized. Not then. Not now. It’s not that I was incapable of playing with with others, well or otherwise. I just preferred doing a lot of things on my own. Whether inside or out, even to this day, if you give me a puzzle or some crayons or a problem to solve, I’d gladly drift off and play, research, discover, create, or simply do my own thing— often much more effectively without the distraction of other people. Having this preference perceived as a problem? Well, it turns out that was the problem, and the labels and concern I encountered from well-meaning adults dogged me for years. It wasn’t until I saw someone wearing a t-shirt proudly emblazoned with the warning, “Does not play well with others” —there are dozens of different models online— that I began to appreciate the silver lining here. In truth, I’m not a bad collaborator and unless there is a ball or a lot of running involved, I’m a pretty good asset for your team. But the best work I’ve done, whether in teaching, writing, or any of my various hobbies, has usually happened when I’ve been left to my own devices. As an extra blessing, my need for approval has declined precipitously over the years. I’ve gotten significantly less worried about fitting in as I’ve gotten older. The freedom that’s accompanied this indifference is exhilarating. There aren’t many hills I’m willing to die on these days, but I am likely to push back against dangerous or destructive policies and practices, especially where kids are concerned, and if that makes me unpopular, so be it. Yes, I’m concerned about the accuracy and clarity of my work, and will do my best to uphold these priorities. But I know that there are people who are not ready to hear what I have to say, and I bless them and wish them well until such time as that is no longer the case. So I thought I’d share a few thoughts on the topic because this feedback‚ and the stigma it carries, still shows up in kids’ lives here and there. Sure, keep an eye out for children who need work on their friendship skills, and those who do have some genuine issues with peer interaction. But a lot of kids get written up because they don’t fit into the roles assigned to them or do well when forced to toe the party line. This is not necessarily a bad thing, especially when you can see beyond the push for conformity so common in our schools, if not our society itself, to the economic and cultural benefits of pursuit of individual passion, thinking, and creative problem solving. Ask questions: What, exactly, does this generic designation mean? Is your child demeaning or hurtful to others? What does this behavior look like and when has it occurred? 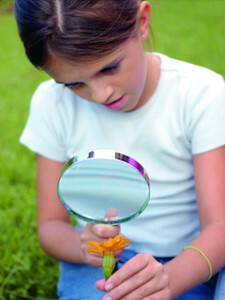 Is your child being mistreated or ostracized? (In this case, I would say the problem is not your child’s.) Or does your kid just like to do stuff that doesn’t involve other people? Because I believe that “playing well with others” has been seriously overrated for a lot of us. What if the kids who “don’t play well with other” are actually the ones who just need a little space and time to themselves to process, think, create, and maybe, just maybe, come up with ideas, solutions, and products that can only happen for them when they aren’t being forced to fit in or interact with their peers? Perhaps the signs my teacher saw when I was in second grade were simply the stirrings of what would one day allow me to start my own business, write my own books, compose my own music, and design my own patterns for sweaters and afghans. Maybe it never had anything to do with “others” at all. 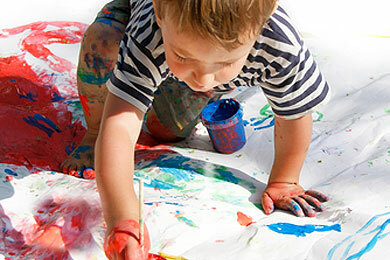 Note: The image of the girl with the magnifying glass came from the Alpha Omega Academy blog, “7 Characteristics of Independent Learners” Image of boy finger painting is from Family Vacation Critic from the Children’s Discovery Museum of the Desert in Palm Springs.